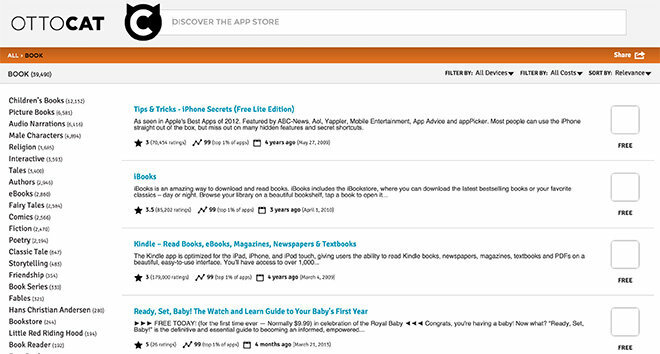 A report on Monday claims Apple quietly acquired startup Ottocat to bolster App Store search functionality, specifically pertaining to the store's "Explore" feature that surfaces titles for users browsing app categories. Ottocat's webpage as seen in August 2013. While little solid proof of Apple's supposed buy exists, TechCrunch reports Ottocat was purchased "some time ago," possibly in mid-2013. The company was founded in May 2013, but apparently closed up shop in October of that year, announcing through its webpage that "Ottocat is no longer available." Circumstantial evidence seems to back up those claims, as Ottocat's official Twitter profile went inactive at around the same time, and Apple introduced Explore a few months later at WWDC in 2014. Linking Ottocat to Apple is a single patent application from co-founder Edwin Cooper. Titled "System and Method for Divisive Textual Clustering by Label Selection Using Variant-Weighted TFIDF," the invention was assigned to Apple with Cooper listed as an employee. The patent has yet to be granted. With Ottocat, Apple purchased technology that plugs into the App Store's backend to organize, aggregate and serve apps based on categorical searches. In current iterations, Ottocat's invention is very similar to the App Store's Explore tab and eschews keyword queries for a system that surfaces apps by directing users through a series of increasingly specific subcategories. Cooper's current status at Apple is unknown. His most recent patent grants and filings go back to Pearl.com (now known as JustAnswer), a consumer advice website that connects users with vetted professionals from a variety of fields. If Ottocat was purchased, it wouldn't be the first time Apple bought a smaller tech startup to help organize its unwieldy App Store. In 2012, the iPhone maker purchased app search engine Chomp and later incorporated the firm's tech and, on iOS devices, card style app information pages.